Based on the relationship between demonstrated housing demand and advertised stock levels we are seeing relatively more stock available for sale compared to demand for that stock across the capital cities at the moment. The months of supply figure compares the number of unique properties advertised for sale to the number of transactions in the market. The analysis provides unique insight into how long it should take to clear the volume of stock currently available for sale. It is important to note that off-the-plan housing stock is typically not advertised for sale as individual properties and as a result is not included within this analysis. Across the combined capital cities, there is currently 4.4 months’ worth of residential properties being advertised for sale. As the first chart shows, the months of supply is currently higher at this point of the year than it has been each year since 2012. The increasing months of supply is largely due to the slowing rate of transaction activity rather than a spike in properties available for sale, indicating demand has diminished relative to advertised supply levels which is pushing the figure higher. Sydney – there is currently 3.0 months of established housing supply available for sale across the city. The city has seen consistently low months of supply over recent years however, the figure is currently at its highest level for this time of year since 2012. Melbourne – established housing stock currently sits at 4.2 months of supply for the city. Supply levels remain quite low but are at their highest levels for this time of year in five years. Brisbane – the city currently has 5.1 months of established housing stock available for sale. The months of supply figure is higher than it has been at this time of year for each of the past five years. Adelaide – there is currently 3.7 months of established housing stock available for sale. Although stock levels are higher than they were at this time over the past two years, stock levels were higher over the three years previous to that. Perth – at the moment there is 8.3 months of established housing stock available for sale throughout the city. 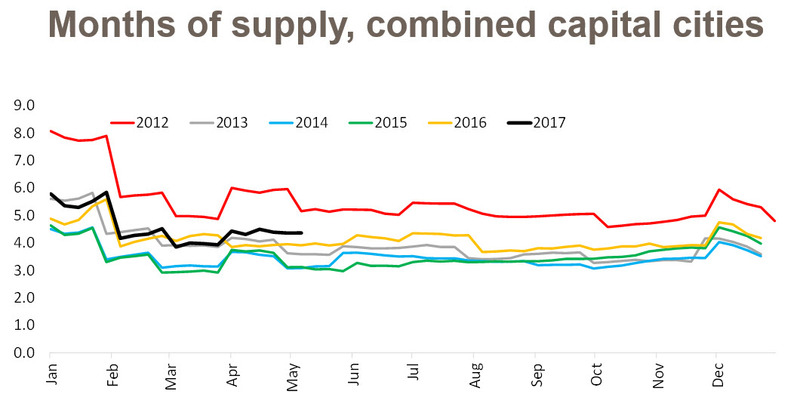 This is a high months of supply figure relative to other capital but it is well down on the 8.7 months at the same time last year. Hobart – the months of supply figure for Hobart is the lowest it has been for many years. There is currently 4.1 months’ worth of established stock available for sale which is down from 5.0 months a year ago and the 7.2 months the year previous. Darwin – across the city there is currently 6.7 months of established housing supply which is well down on the 10.5 months at the same time a year ago and 7.5 months over the previous year. Canberra – there is currently 2.6 months of supply of established housing stock for sale in Canberra. The months of supply level is the same as what it was a year ago but lower than the previous years highlighted. Based on these figures it seems that the supply of stock for sale relative to demand is increasing in Sydney, Melbourne and Brisbane. Meanwhile demand is outweighing supply in Hobart and Canberra leading to a decline in the months of supply. In Perth and Darwin supply continues to dramatically outweigh demand but the balance is slowly improving. In Adelaide there has been little change in months of supply over recent years suggesting the market is in relative equilibrium.